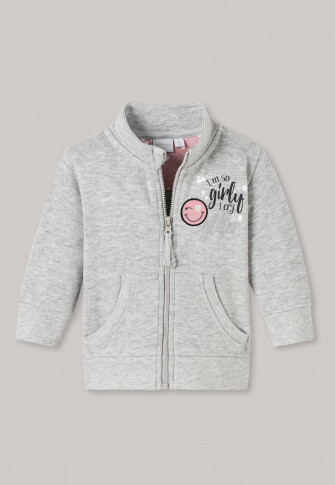 Our little ones will really impress in this heather gray baby sweat jacket! A cute smiley appliqué with glitter lettering "I'm so girly i cry glitter" attracts everyone's attention and is accompanied by lots of great details: For example, the stand-up collar, zipper with chin guard, ribbed cuffs, or the casual kangaroo pocket. On top of that, there's also the best SCHIESSER quality, and your new favorite jacket for cool baby girls is ready to go! Chest motif with smiley appliqué in pink and anthracite, glitter lettering "I'm so girly i cry glitter"